OK, trivia fans: One of the more "serious" products that the Wham-O toy company made was a complete home fallout shelter kit. It was sold by mail from advertisements in various monthly magazines. 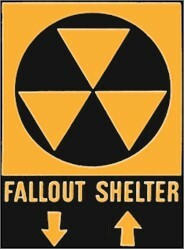 I don't think anyone ever took a fallout shelter for a test run, sleeping in it for a weekend to see if it all worked. There were the stories (fiction) about families who moved into them and went berzerk. In the classroom in public school (a.k.a. "elementary school") in the early 1950's the teacher out of the blue would yell "Take Cover!" We had to immediately scramble beneath our desks onto hands and knees facing away from the window and cover our eyes with our little hands. Teacher would walk around the room making sure everyone was facing the right way (some weren't lol) and our eyes were covered (to protect them from flying glass), and stay there until teacher announced "All Clear." Only then we could get up (amid much excited talking) and the lesson resumed. Seems quaint now, but being just a few years out of WW2 the idea of terror from the skies was still very much with us. We also were shown filmstrips during "V.I." (Visual Instruction) of bombing raids and the proper way of seeking shelter and behaving in the classroom. Movie theaters showed similar public service shorts on the same theme between movies (it was always two movies in the "movie theaters" in those days) in the late 40's early 50's. Not very many people in my area built bomb shelters...I also do not remember any drills for an atomic attack...but we did have fire drills, and maybe the fire drills were sufficient to count as such! Maybe one of the reasons why not many people built bomb shelters in my area was that we were less than 100 miles from Ground Zero! Oh yes I do remember seeing the fall out shelter signs around when growing up! Yes we did do emergency safety drills at school at random to keep us aware . In all seriousness, my entire first semester of health class in 1975 was "surviving a Nuclear War" and yes, they actually showed the "Duck and Cover" film from the 1950's. We had one in the basement of our 1958 rambler. It was a windowless room with concrete block walls and a heavy door. 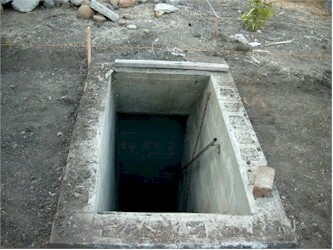 We called it the bomb shelter but we used it mainly as a storage room. However, we always left just enough space for the eight of us to duck in there when the tornado sirens sounded. There was no electricity in that room and it was always cold. You don't see the fallout shelters as much as you used to but you still see the signs here and there, especially inside the stairwells of older buildings.